For the first time since the return in Serie A in the summer of 2007 we did not loose in Florence. Every year we play a good match in Artemio Franchi, but we always lost with an unlucky goal. 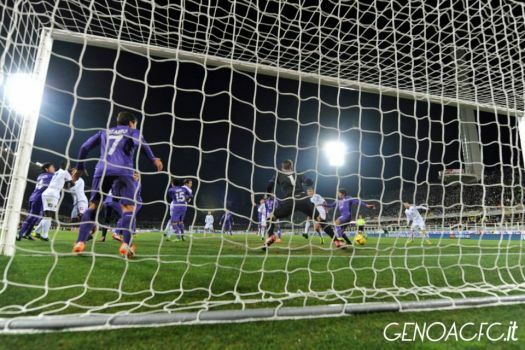 Like last year when Cassani scored the winning goal of Fiorentina in our own goal. This year we scored 3 times by Gilardino (penalty), Antonini and De Maio, while Aquilani scored all 3 goals of the Viola team. After the victory against Inter the 2nd good match with unexpected points for the team of Gasperini. Next week we play the derby on Sunday, or Saturday or Monday (hopefully not). 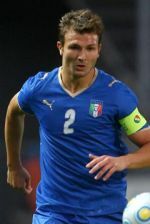 Because the 4 new players are all defenders and midfieldplayers we expect also 1 or 2 new wingstrikers to support Gilardino. Also 4 players left us this transferperiod: Lodi (Catania), Manfredini (Sassuolo), Biondini (Sassuolo) and Sampirisi (Olhanense, Portugal). We thank them for joining our great club! 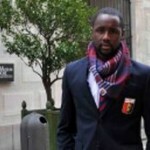 Genoa has beaten Inter for the first time since 1994 (goals Van ‘t Schip and Ruotolo). After our return in Serie A in the summer of 2007 we haven beaten everyone at least one time, except Inter till today. 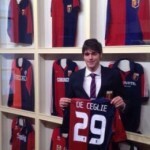 Genoa missed the injured Portanova and Kucka, while Matuzalem was banned after his red card in Rome. Because of the heavy rain the field of Marassi was very bad and during the match some little lakes formed themselves. Both Gilardino and Palacio (Inter) probably would have scored if the ball wasn’t stopped by a little lake on the field. 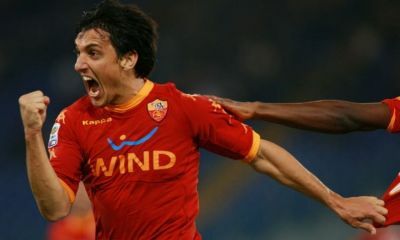 The only goal was scored by Luca Antonelli with a header in the 83rd minute. 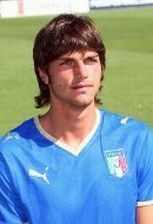 Our best player was without any doubt: again goalkeeper Mattia Perin who was unbeatable by Milito and Palacio. After the last whistle of referee Rizzoli everyone went crazy, even gentlemen Gian Piero Gasperini who was for a short time coach of Inter. A.S. Roma was much too strong for the Gasperini-boys. 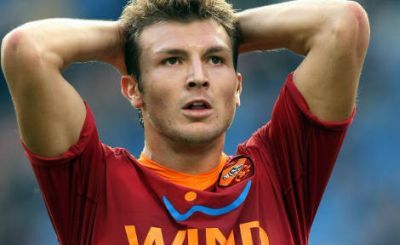 Without experienced players like Portanova, Gilardino and Kucka this Roma played with our team. Thanks to Mattia Perin and the fact that Roma did not score after Matuzalem was send away with 2 yellow cards in the beginning of the 2nd half the score was only 4-0. Let’s hope this was an incident. Against Roma the Swiss defensive midfieldplayer Cabral of Sunderland already played with us. 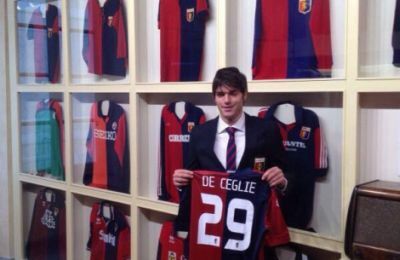 Next Sunday against Inter we hope that also De Ceglie and Motta (both coming from Juventus and Italian international in the past) can make their first minutes in our fantastic red and blue shirt. The two players who both will probably sign their contract later today have to substitute Lodi (back to Catania) and Manfredini (Sassuolo). Lega Calcio has decided that the derby is on Sunday 2nd February at 12.30 hours. After 5 matches without a victory (3 draws and 2 defeats) and matches against Roma, Inter and Fiorentina ahead a victory today againt Sassuolo was necessary. Without Kucka and our defenders Antonini, Portanova and Gamberini our friendly coach Gasperini started with De Maio, Marchese, Bertolacci and Konaté in the line-up. In the 28th minute Luca Antonelli was fouled in the penalty-area and Alberto Gilardino scored the penalty in the roof of the goal (see foto). 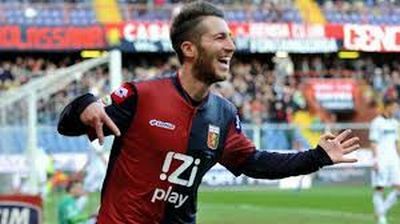 One minute before halftime Bertolacci scored the 2nd goal after a perfect assist of Konaté. In the second half Genoa froze the match, while Alberto Gilardino missed the 2nd penalty in the 89th minute after he was fouled. The victory was number 500 of Genoa in Serie A and brings us on the 8th position in the standings with 23 points, 9 ahead of the relegation-zone.